The pilot of the doomed EgyptAir flight spoke to air traffic control in Egypt for several minutes just before the plane crashed, a French television station has claimed. This account directly contradicts the official claim that there was no distress call from the plane. M6's story, quoting unnamed French aviation officials, was not confirmed by the French air accident investigation agency, the BEA. No such information had been passed by the Egyptian authorities to three BEA investigators who had flown to Cairo to take part in the official inquiry, the agency said. M6 said that the pilot of the Egyptair A320 had "a conversation several minutes long" with Cairo air traffic control after the plane ran into difficulties in the early hours of Thursday morning. As a result of the conversation, the pilot decided to make an "emergency descent", depressurising the cabin, in an attempt to clear smoke fumes which had invaded the front of the aircraft. The claims follow reports of leaked flight data showing trouble in the cockpit and smoke in a plane lavatory just before the plane crashed. Officials have cautioned it's still too early to say what happened to the aircraft, but mounting evidence points to a sudden, dramatic catastrophe that led to its crash into the eastern Mediterranean. The Egyptian military on Saturday released the first images of aircraft debris plucked from the sea, including personal items and damaged seats. Egypt is leading a multi-nation effort to search for the plane's black boxes - the flight data and cockpit voice recorders - and other clues that could help explain its sudden plunge into the sea. 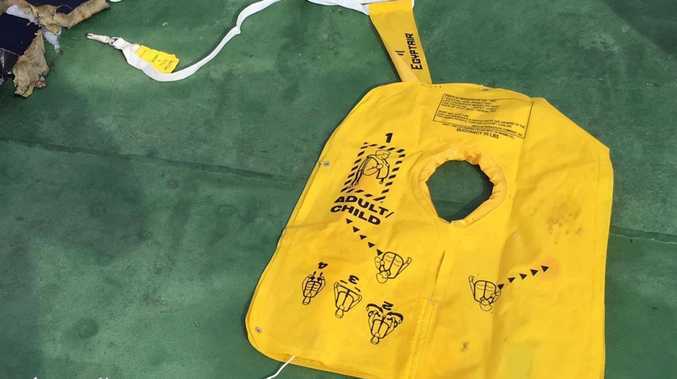 Authorities say the plane lurched left, then right, spun all the way around and plummeted 38,000 feet (11,582 meters) into the sea - never issuing a distress call. The Facebook page of the chief spokesman for Egypt's military showed the first photographs of debris from the plane, shredded remains of plane seats, life jackets - one seemingly undamaged - and a scrap of cloth that might be part of a baby's purple-and-pink blanket. The spokesman, Brig-Gen. Mohammed Samir, later posted a video showing what appeared to be a piece of blue carpet, seat belts, a shoe and a white handbag. The clip opened with aerial footage of an unidentified navy ship followed by a speedboat heading toward floating debris. Flight 804 left from Paris' Charles de Gaulle Airport on Wednesday night en route to Cairo with 66 people aboard. The first available audio from the doomed flight indicates that all was routine as the pilot checked in with air traffic controllers in Zurich, Switzerland, around midnight, before being handed over to Italian air traffic controllers in Padua (Padova): Pilot - "This is 0-7-2-5 Padova control. (Unintelligible) 8-0-4. Thank you so much. Good day er good night." The communication, taken from liveatc.net which provides live air traffic control broadcasts from around the world, occurred about 2 hours before Greek air traffic controllers lost contact with the plane. Greek officials say at 2:24 a.m. local time the flight entered the Athens sector of Greek airspace. Twenty-four minutes later, controllers chatted with the pilot, who appeared to be in good spirits. In Greek, the pilot quipped: "Thank you." Less than 15 minutes later, about midway between Greece and Egypt, a sensor detected smoke in a lavatory and a fault in two of the plane's cockpit windows, according to leaked flight data published by The Aviation Herald. Messages like these "generally mean the start of a fire," said Sebastien Barthe, a spokesman for France's air accident investigation agency. But he warned against inferring too much more from the reading. "Everything else is pure conjecture." At 3:27 a.m. Greek time, air traffic controllers in Athens attempted to contact the plane to hand over monitoring of the flight from Greek to Egyptian authorities, according to Greek officials. There was no response from the plane despite repeated calls, including on the emergency frequency. At the same time, a sensor detected that smoke had reached the aircraft's avionics, the network of computers and wires that control the plane, according to the leaked flight data.